"The Larkspur Inn Gone Up in Smoke. IT WILL BE REBUILT SOON. Loss Sixty Thousand Dollars, Partly Insured. EXPLOSIONS OF OIL RESERVOIRS. The Fire Spread Through the Surrounding Underbrush— Nobody Hurt— Some Close Calls. A heap of smoldering ruins, in the midst of which four ghastly chimneys still standing, are all that remain of the Larkspur Inn at the pleasant little suburb of Larkspur. In an hour and a half $60,000 went up in flame in spite of the efforts of the employees and the assistance of the citizens and the San Rafael Fire Department. A defective flue from the kitchen caught fire at 11:30 o'clock yesterday morning and before it was discovered the blaze had secured headway on the third floor and roof. No water supply adequate to the emergency was available. A large reservoir is built on the hill behind the hotel site, but the pumps could not bring the water in fast enough. Buckets and hand pumps were pressed into service from the neighboring cottages and the volunteers held the flames in check long enough to save most of their property. About thirty people were staying at the Inn and when the fire broke out a number of ladies and children were greatly frightened, as the men were for the nuisit rait in San Francisco. Fortunately the wind was from the east and as the fire started in the western end of the building it made slower progress than might have been expected from the character of the structure, which was of frame with a shingle roof. The most dangerous feature of the fire was the fact that coal oil pines ran to all parts of the hotel and storage tanks were placed on each floor. A number of explosions of the coal oil occurred while the building was burning, and Michael Maguire, the porter of the Inn, narrowly escaped being seriously injured while bravely fighting the fire and rescuing the property of the guests. Although 200 feet of fire hose was kept on hand, it was impossible to get it out in time to do any effective work. Sheriff Harrison took command of the volunteer firemen, and did much to reassure the frightened women and children. The Larkspur Inn was built three years ago by the American Land and Trust Company of 9 Beale street, and President Wright was informed of the loss. 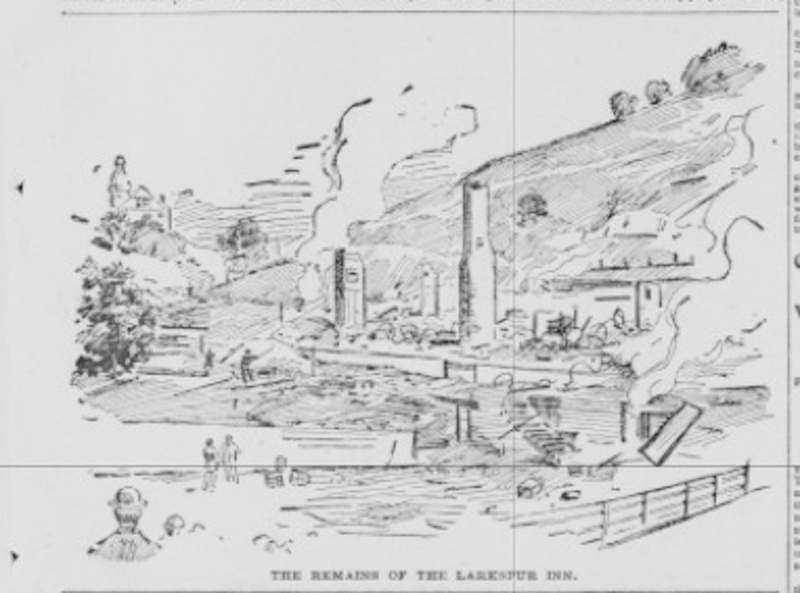 Both Mr. Wright and the lessee, K. M. Briare, were absent in this city during the fire, and arrived only to find a heap of smoking embers and twisted iron rods where their property stood when they came to the city. The insurance on the building and furniture was placed as follows: Springfield Fire Insurance Company, $1500: Prussian National, $3000; Union, $2500; Fire insurance of Pennsylvania, $500; Palatine, $4500; British America, £1500; American of New York, £1500, and the Western of Toronto, $1500. Several other companies hold risks amounting to 830,000. The loss to the company, and personal effects of Mr. Wright and Mr. Briare to the value of about $1500 each were destroyed. Several employees lost all their clothing. Enterprising hotel-keepers from Mill Valley, San Rafael and other neighboring towns were promptly on the prowl and the guests found accommodations easily. The hotel was built at the foot of a steep and wooded hill, and some of the underbrush caught fire, leaving a blackened track nearly to the top of the slope. People were at once directed toward stamping out the fire in the brush, and it was brought under control. Several camping parties located near the burning building were nearly broken up by the spread of the flames. No one was injured. The owners of the rescued property, which was scattered over the surrounding ground were endeavoring to identify their belongings as darkness settled. ​A guard was placed to prevent thieves from taking advantage of nightfall to plunder. President Wright stated that the inn will be rebuilt on the same plan by January 1, and will be thrown open next spring. Among the guests were: W. Wright and family, John McGee and family, T. Sullivan and family, H. Stilwell and family, Mr. Kahu and family, Mrs. Reese and family, Mr. and Mrs. Anderson, and the Misses Lilesheim, Galley, Crueli and Gibers. F. Keade, the clerk of the hotel, narrowly escaped being caught by a falling wall. The San Rafael volunteer firemen came over on a special train, but could do nothing toward saving the structure on account of lack of water."